Jesse Evans was the son of Joseph and Agnes Evans, Church Road. From census records Jesse had sisters Charlotte, Agnes, Mary, Beatrice, Jane and Dorothy. In 1901 the family was living at Marford. In 1911, at Church Rd., Jesse age 14 was working in a brickyard. At 19, Jesse was one of six on the Memorial with that age. Only one, Harry Fox, was younger. Jesse was the great uncle of Danny Shaw who tells us that Jesse lived in Buckley but gave his sister’s address in Mancot because of his age and aiso didn’t want his parents to stop him going to War with his Pals. He never returned home. 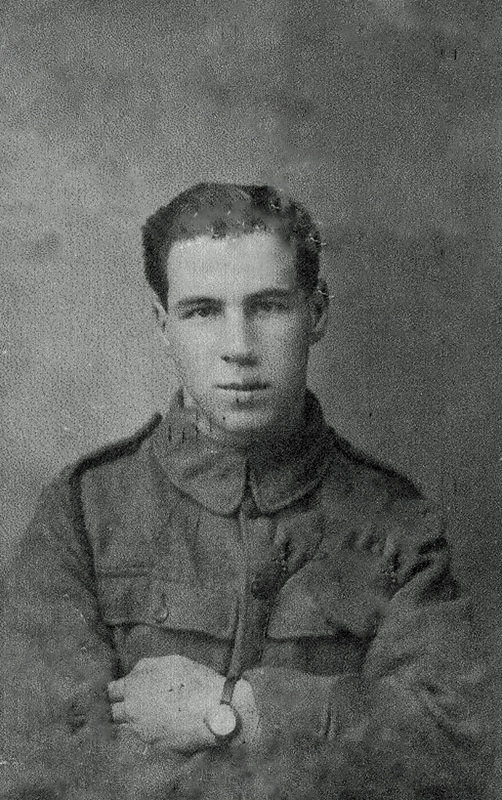 Private Jessie Evans, King’s Royal Rifles, is reported to have been wounded. His parents. Mr. and Mrs. Joseph Evans, reside at Church-road, Buckley. News reached Buckley on Monday from the War Office that Rifleman Jesse Evans, of the King’s Royal Rifles, who was reported wounded last week, has since died from wounds received during the severe fighting on the Somme. He was a communicant and Sunday School teacher at the St. Matthew’s Parish Church and before the war belonged to the Church Lads’ Brigade. He joined the Army at the commencement of the war, and has been on active service for nine months. His parents, Mr. and Mrs. Joseph Evans, reside in Church-road, Buckley. Mr. and Mrs. Joseph Evans of Church Road have received the sad news that their son, Rifleman Jesse Evans had died of wounds on 16th July at the Clearing Station in France, aged 19. Before enlisting he was a drummer in the St. Matthews’ Church Lads’ Brigade. He enlisted in September 1914, and went into training at Denham and subsequently at Salisbury Plain, and from there they went to the front in October 1915. Rev. G.T. Gravell, who was captain of the Church Lads’ here speaks well of him in a letter to his parents. Jesse is remembered on the family grave at St. Matthew’s. Jesse was the great uncle of Danny Shaw who provided this photograph.